I Bleed Crimson Red: On the Democrats’ Kavanaugh Debacle, Doug Jones didn’t care what his constituents wanted. On the Democrats’ Kavanaugh Debacle, Doug Jones didn’t care what his constituents wanted. Yellowhammer News had this piece last weekend, just before Alabama’s Junior Senator Doug Jones followed the party line and vote “No” in the Roll Call vote on Brett Kavanaugh’s confirmation to the United States’ Supreme Court. On CNN “New Day, “Jones was asked point blank if he thought a majority of his constituents wanted him to vote to confirm. His response shocks absolutely no one. The key exchange comes at about the 4:18 mark in the roughly 5:00 segment. The full segment is interesting. Give the host some credit for setting a surprisingly unbiased stage for Jones, but notice that Jones completely evades any and all direct questions from the host. Jones is evasive on the very first question and tries his best to act as if he is sad about the climate that his own party created. 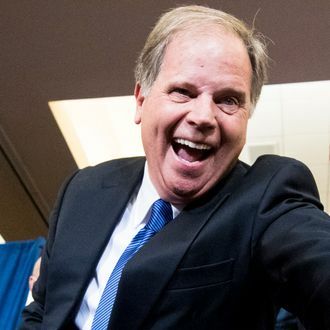 Remember, Jones is the only sitting Democrat elected in a statewide election in Alabama. As far as Alabamians are concerned, he is the Democrat Party in this state. He is the party’s lone standard bearer in the Yellowhammer State and he just hates to see such bitterness and turmoil? More on how he could have changed his party’s image below the clip. He voted “no,” because he “was the one who spent all the time and hours…” researching Kavanaugh’s record. Before saying that, he dismissed the high probability that Alabamians approved of Kavanaugh’s confirmation, saying that the majority opinion of Alabama voters was not the “be all and end all” of this process. This is why Alabamians generally don’t like Democrats. We’re just fine thinking for ourselves, sir. Had Jones’ office even bothered to consider Alabamians’ opinions on the nomination, he would have paused. He would most assuredly have found that at least a plurality—if not a clear majority—wanted Kavanaugh confirmed. And had he done so, he could have ended the national nightmare that lasted from Sept 27 through October 6. If you watched the news or followed events of those nine days online, you saw American politics at its ugliest. If you have small children, you had to hide their eyes and ears from the evening news and no parent should have to do that. “I have considered the testimony before the Senate Judiciary Committee. I have reviewed Judge Kavanaugh’s record and qualifications. I have considered the voices of my constituents. While I have concerns about Judge Kavanaugh’s positions on some matters, I cannot find any evidence that disqualifies this nominee. Accordingly, I will heed the wishes of my constituents and I will vote to confirm Judge Kavanaugh. Jones voted against Kavanaugh because Chuck Schumer told him to. The allegedly centrist independent toed the party line and made up a lousy excuse for it. Instead of taking his first opportunity to display his Maverick bona fides and buck party loyalty, he caved to the Democrat mob and followed orders. Alabama voters have very long memories. The national political circus will move on to about 63,096 different topics between now and November 2020. We won’t. We will remember that we gave Doug Jones a chance to be the independent he claimed to be and failed at the first chance he had.